Eye brushes intimidated me by far the most when I started in on my Adventures In Makeup; there are so many types! Angled, blender, blunt, bullet, chisel, contour, crease, detailer, dense, dual fibre, flat, fluff and fluffy, lay down, liner, natural fibre, oval, pencil, pointed, slanted, smudger, socket, square, stippler, straight, synthetic, tapered ... not to mention the combinations thereof. It really can be quite intimidating. But there's really only few types of brushes you need, I've roughly divided these up into five categories and each day I'll talk you through each one... hopefully by the end of the week eye makeup brushes will be well and truly demystified! Some of the lay-down brushes I use. You definitely categorically absolutely need one lay-down brush (at least one). As you will see from the picture above, most of these are reasonably flat, reasonably dense, reasonably large. Most are natural fibre (except for the Laura Mercier Camouflage Powder brush, the Inglot S/S and the Make Up For Ever 6N, which contain synthetic fibres. The best lay-down brushes are flat. You can use the side of a fluffier brush as a lay-down brush, but I generally don't tend to. These are called "lay-down" brushes essentially because they are used to "lay down" a base of eyeshadow, or to "lay down" a colour on the lid, and these can be used in two ways. The "outer v" of your eye is roughly the red area as shown: ie the area from about a quarter to a third of the way in your outer crease "line" down to your lashline, as if you were extending your lower lash line upwards to meet it. My favourites: the fourth, third & second from the right, and the fourth from the left. Or any flat brush. If a SA is trying to sell you something a bit fluffier, don't bother. You want to be able to pack-on shadow with this, and you can't with a fluffier brush. How to use this brush? For a "standard" eyeshadow look, I'll do the following: I'll use my lay-down brush to apply the base, by applying a wash of powder eyeshadow by brushing the flat side of a flat lay-down brush on your eye area, from the lash-line all the way up to the brow bone. This is just base, and not something you want to do waste time on, so a larger brush generally works better. My preference is for the MAC 252, which helps me whack on a base in no time flat. When I want to add colour to my lid area, I'll use a smaller lay-down brush. In general, for powder shadows, a denser, flat natural fibre brush will give you a denser finish. 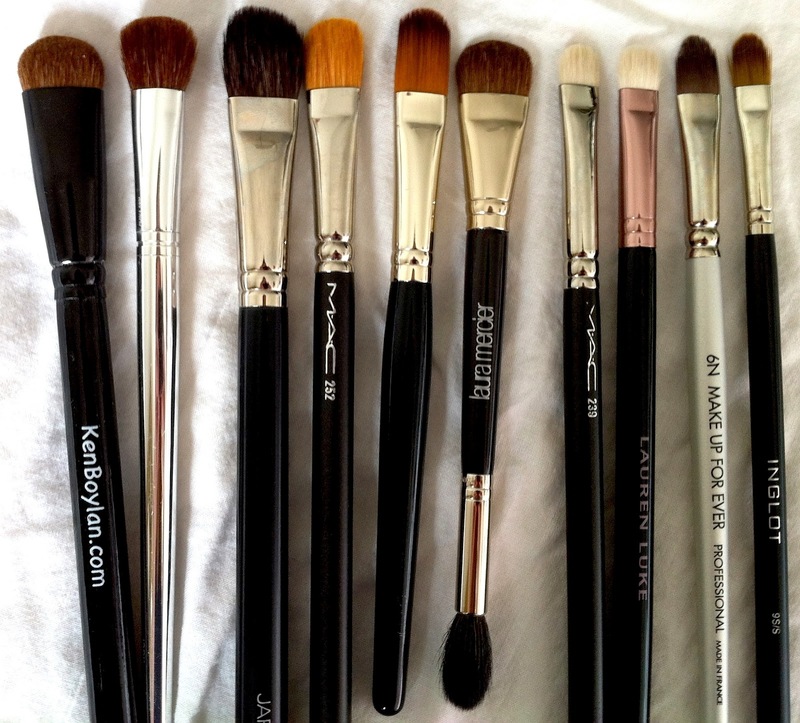 My preferred brushes are the MAC 239 or the Lauren Luke equivalent (reviewed here) and also the Make Up For Ever Pro 6N. The latter is probably my favourite over-all, as it is shaped to a point and can be used to pat colour all over the lid, with the point of the brush doing the work in your outer-v for you. To use the brush to pack-on shadow like this, pat it into the eyeshadow, then simply pat it, flat-side down, onto your eye area until you're happy with the amount of colour on your lid; don't use a brushing/sweeping motion, you don't want to use it to blend. As with all eyeshadow application, don't forget to tap away the excess first or you can wind up some fall-down underneath your eye. And the more thin layers you apply, the longer your shadow will last, so packing one big glob of eyeshadow on your lid will see it fading away over the day, whereas a gentler application of two-three thinner layers will last longer! A cut-crease is simply a very defined crease/socket area. "Very defined" may mean sharp or more diffuse, but either way, it's more defined than a more usual/bog-standard/day-time/blended-out/soft/less distinct crease. In the same was as with Point 3, the edge of a lay-down brush (especially the MAC 239 & Lauren Luke equivalent) can be used to apply colour into the crease area in order to "cut" it). There are many tutorials on cut-creases on YouTube (and elsewhere) so I am not going to go into detail here, however the technique essentially calls for a pointed edge brush, so the edge of these brushes can be used in the same way as a pencil brush (see later in the week for information on pencil brushes) for this purpose. Again, you're using the edges of the same two mentioned brushes to apply definition to your outer-v area, and then using the flat side to add more colour in from that defined area about 1/4 or 1/3rd of the way in along your eyelid. This is just a way of using one brush for the two purposes, but you can of course use something like a pencil brush to create the initial definition if you prefer.